Immigration and Customs Agents were forced to take matters into their own hands after the NYPD refused to follow orders. 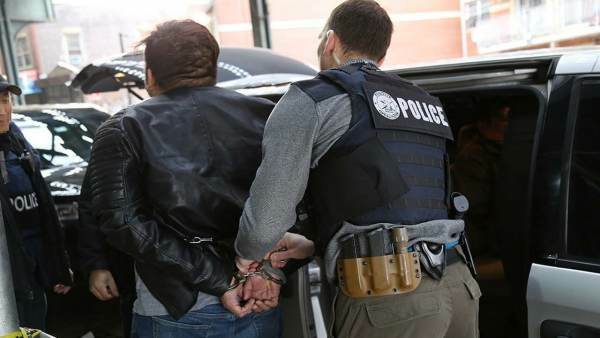 In a six-day blitz titled “Operation Keep Safe,” ICE agents made 225 arrests, 180 of whom were convicted of numerous crimes. I would have been embarrassed to have posted this article. Nobody has stopped them from doing their job. It is their job. NY isn't letting murderers go. NYC is a sanctuary city. Sanctuary cities refuse to cooperate with ICE. They shouldn't let any criminals go---especially illegals. And, yes, Obama did prevent ICE from doing their job. They arrest them, they hold them, they get deported and then next month they have to do it all over again. That is an expensive broken system. It's up to the Feds to fix it, not the states as the states can not. Australia got it right. Ship em to an island with no means of return. Trump is trying to do something and his wall is being blocked by feel good politicians that see nothing wrong with open borders. It is so basic yet they don't get it. Illegal aliens cost us Billions of dollars each year from dealing with them in the justice system, to paying their bills at the emergency room to educating their kids. There are cities and states that are pushing back on immigration reform and making it difficult for the Feds to enforce existing laws. It is so basic, the front line that is the Police catch a guy committing a crime, he goes through the system and it is found out he is illegal, the police then have a choice to make, either turn the guy over to ICE or let him go. In a sanctuary area they let him go to either disappear or to be caught again when he ups the level of crime. In Boston we had a case where an legal alien robbed 2 banks and the lousy liberal judge sentenced him to one day less than a year in jail so as not to trigger his deportation. He was out in 9 months. I have a feeling that if I robbed 2 banks I would be going away for 9 years not 9 months... When the guy got out of jail he thanked the judge for his leniency by breaking into, robbing then cutting the throats of 2 doctors who were legal immigrants by the way and having a shoot out with the cops. Why does the Left try so hard to keep these people living among us? I wonder if their tune would change if they or a member of their family became a victim of a crime at the hands of someone that shouldn't have been in the country?